9. B&W films, raw stock. 13. Pro color negative films. 58. Freezer in salt mine. 67. Film for 1888 Camera. Errata: An error has been reported: Fig 152. Replace "grams" with "grains". 1 Gram =15.4 grains. My apologies. 196. Film coating room 1889. 293. 4 x5 inch Sheet Film. 1. I am self-publishing this book. I make no promise that it will ever be printed again. 2. 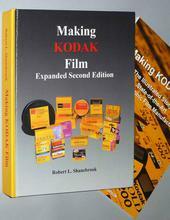 No one else, including Eastman Kodak Company, has any rights to ninety-five percent of the contents of this book so the information may not ever be available from other sources. 3. I vigorously protect my copyrights, "like a junkyard dog". I intend on giving the rights to an educational institution. I don't want the rights to be compromised when they are gifted. 343. Temp and RH chamber.